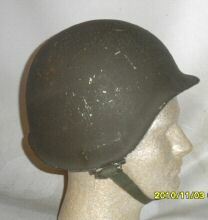 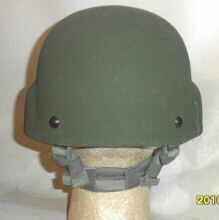 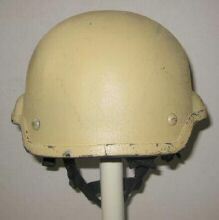 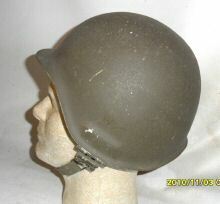 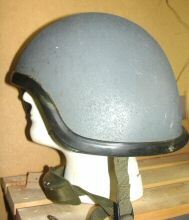 PASGT - the original PASGT (Personal Armor System Ground Troops) helmet, the first of the really familiar ballistic plastic helmets. 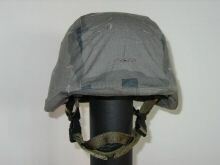 This one actually is made of Kevlar - composite helmets are frequently referred to as 'kevlar helmets' but in reality they are made of a number of different substances. 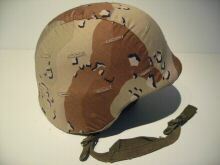 Some have no kevlar in their make-up at all! 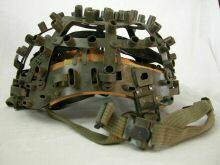 This example has the original two-part chinstrap - rapidly found ineffective, this was soon replaced by a three- or four-part chinstrap rig similar to that found on many European composites. 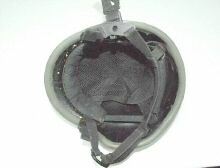 The shows a common problem with the composite helmets, which are made from multiple sheets of material pressed and moulded together - this is 'delamination', where the layers begin to peel apart. 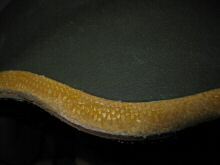 Often seen on the surface. 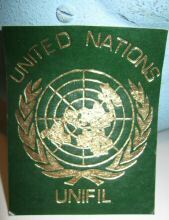 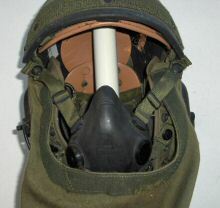 This example used by UN forces in Lebanon, 1983. 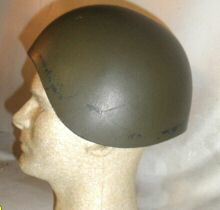 "Prototype helmet design for the PASGT helmet (human factors evaluation) program early in 1974. 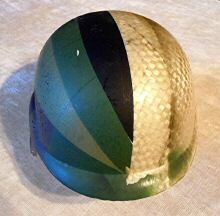 Approximately 36 of these helmets were made. 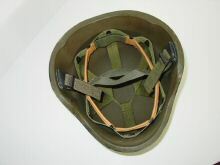 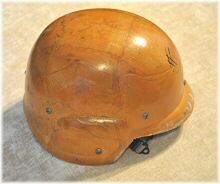 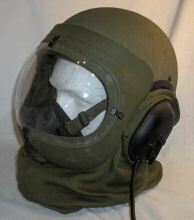 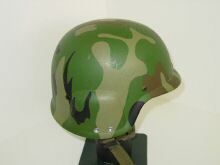 The helmet is constructed of epoxy resin and fitted with an M1 type chinstrap. 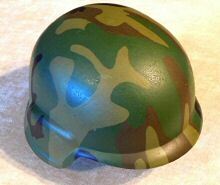 The exterior of the helmet is coated with a skin of ABS (Acrylonitrile, Butadiene, and Styrene, a very tough, impact resistant plastic." 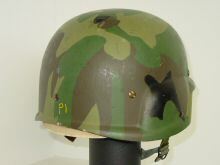 "I own two of these early resin helmets, the camo patterns are nearly identical and they are painted on the helmet surface. 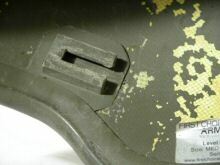 Close exam shows some brush marks and even a few small “runs” of paint. 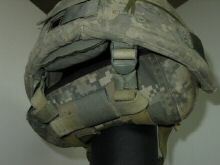 Both helmets have the same exterior texture which I think is the ABS skin, the interior finish is smooth. 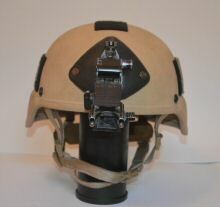 This set of photos shows my second helmet fixed with the adopted PASGT chinstrap configuration, note only one set of mounting holes. 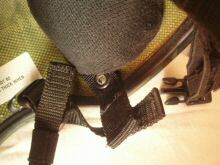 Also note the second set of holes left empty due to relocating the interior webbing for a better fit. 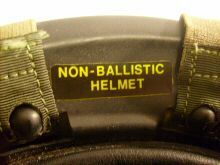 Other than these modifications, the helmets are the same." 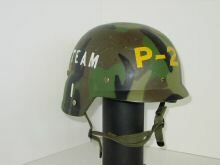 "This helmet is part of the second phase of the PASGT "development program" that tested two different ballistic materials, one being Kevlar and the other was Glass Reinforced Plastic (GRP). 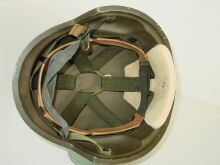 Helmets were compression molded in both materials (I have seen small, medium and large sizes) and subjected to a battery of tests (a few being Durability, Arctic, Compatibility and Operation). 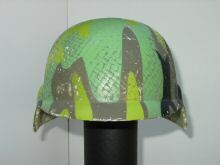 This example is made of compression molded Kevlar and shows one of the less common camouflage patterns." 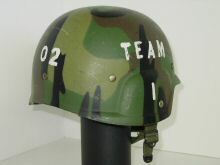 PASGT - early test and trials example. 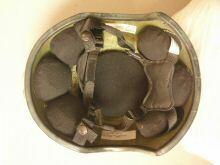 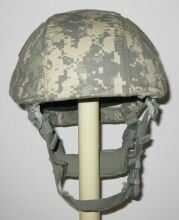 "A Kevlar, compression molded, PASGT prototype helmet that was part of the development program phase. 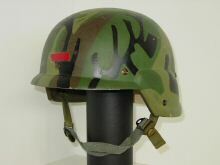 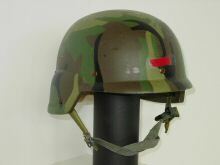 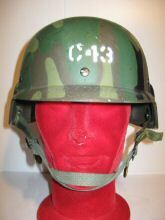 This helmet has a very unusual camouflage pattern and shows a red tape flag reported to have been used by a USMC Landing Support Battalion known as “Red Tags” (see Chris Armolds book “Painted Steel” Pg. 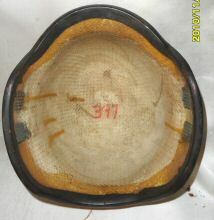 373). 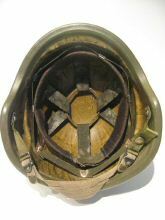 This helmet is also fitted with an early Parachutist’s Pad." 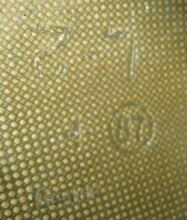 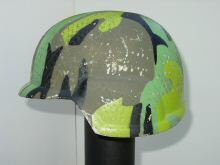 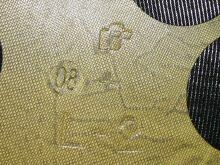 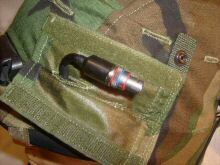 This example is made of compression molded Kevlar and shows a very unusual Camo pattern; other than M.A. 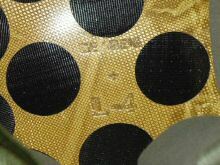 Reynosa's book, this is the only other I have seen with this pattern (though I’m sure there are others out there)." 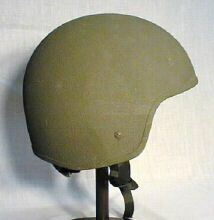 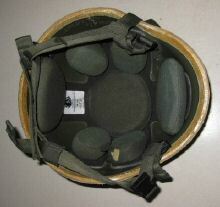 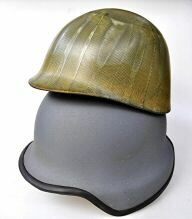 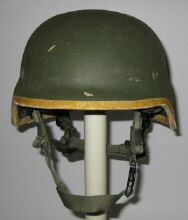 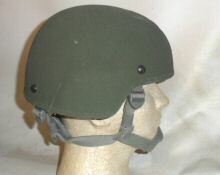 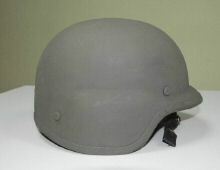 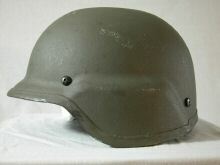 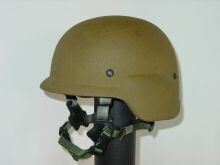 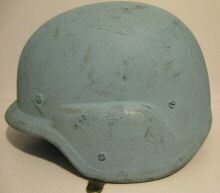 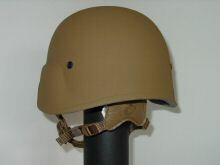 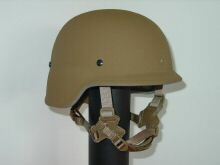 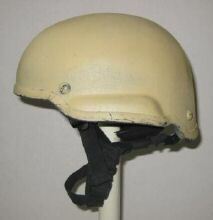 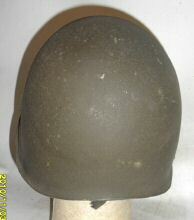 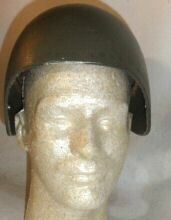 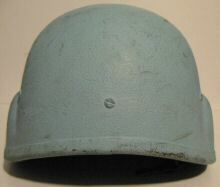 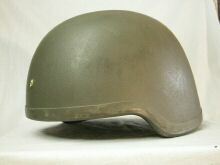 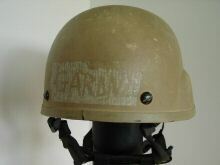 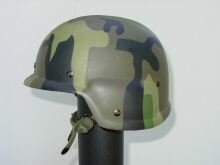 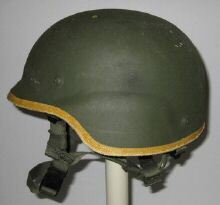 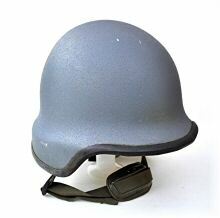 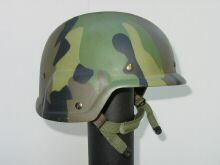 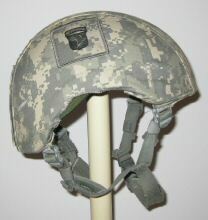 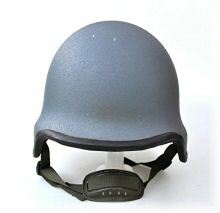 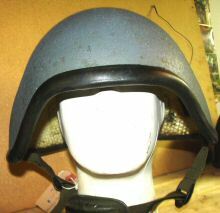 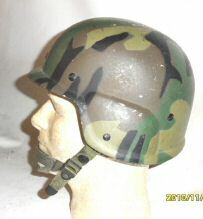 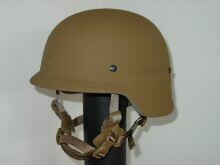 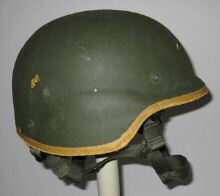 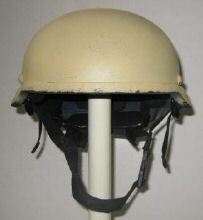 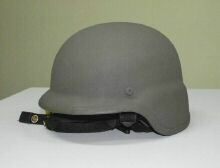 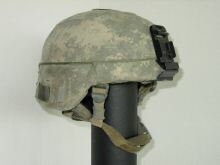 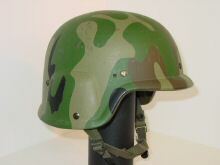 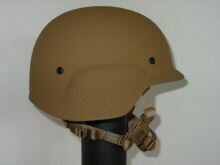 "A PASGT 'development program' helmet made of Glass Reinforced Plastic (GRP). 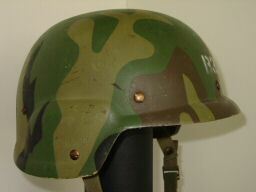 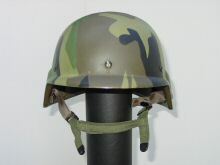 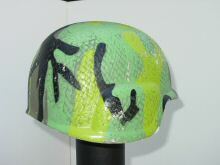 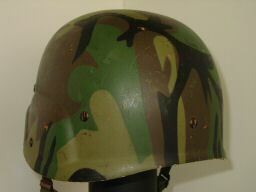 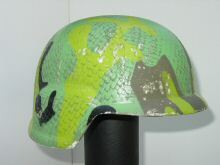 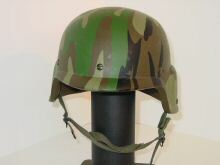 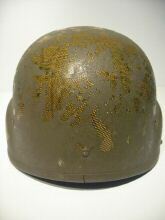 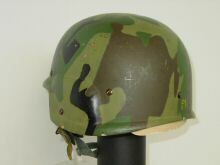 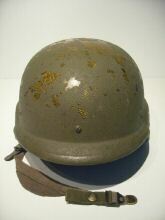 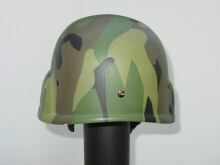 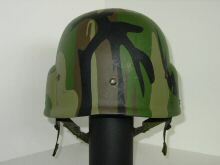 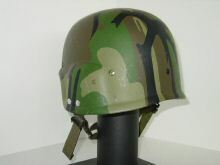 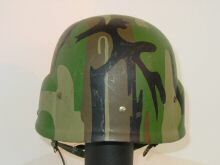 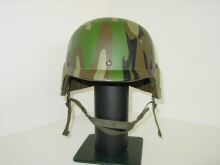 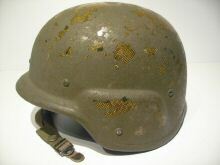 The helmet surface shows the GRP weave and an unusual camouflage color in the more common pattern." 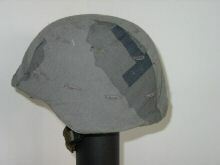 PASGT - epoxy trial helmet"
This particular version is made of epoxy resin and was used to test form and fit. 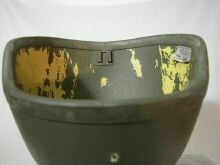 The finish is painted on and the interior is matt OD." 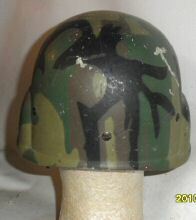 PASGT - early test/ experimental version, painted-on camouflage. 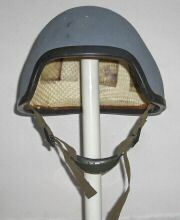 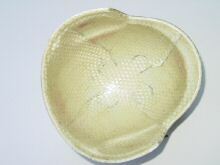 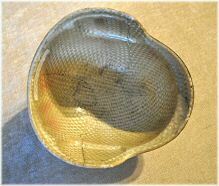 "Another example of a helmet made of compression molded Kevlar. 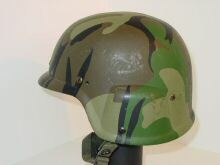 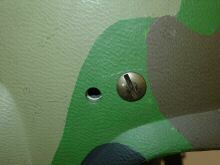 Though the Camo pattern looks like the most common version found on GRP helmets, it is not. 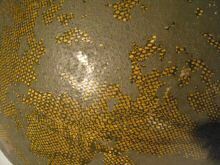 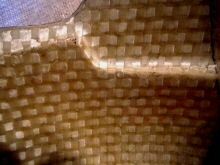 I have looked for this unusual pattern a very long time; it is shown on page 17 of Reynosa book." 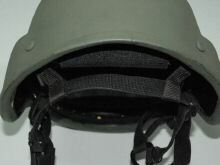 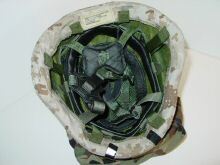 MICH helmet "Modular Integrated Communications Helmet"
also known as ACH helmet "Army Combat Helmet" Constructed of Kevlar (para-aramid synthetic fiber). 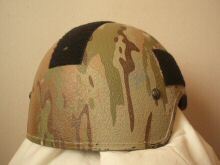 Made by MSA. 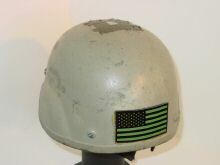 "This helmet was worn by my nephew through 2 tours in Iraq. 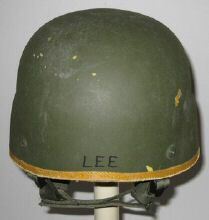 He started his Army career in the101st Airborne, then trained and became a member of the 5th Special Forces Group ODA 581 before deploying." 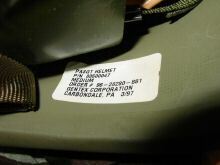 "When I purchased this helmet, I was told it was a development item for the Marine Corps effort to produce their own, improved helmet VS using the existing Army PASGT model at that time. 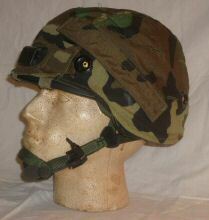 (note: other than the sellers comments, I have no documentation to confirm this is a USMC sponsored item) . 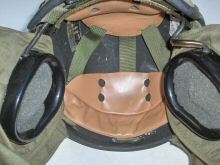 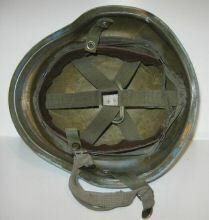 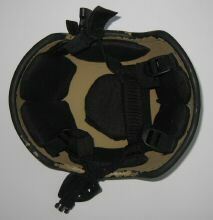 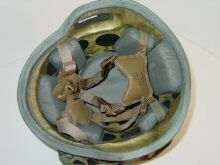 It is made up of Kevlar and sports a unique chinstrap configuration, it also has a "Parachutist's Pad”. 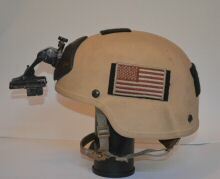 The helmet did not come with the “MOUT” (Military Operations in/on Urban Terrain) cover shown in these photos. 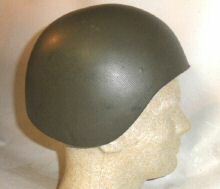 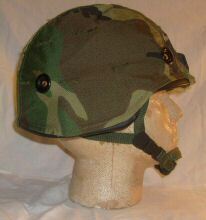 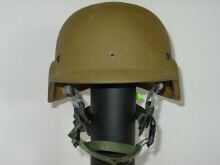 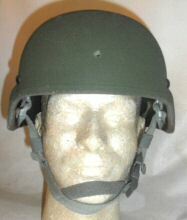 "This is the first production version of the USMC Light Weight Helmet. 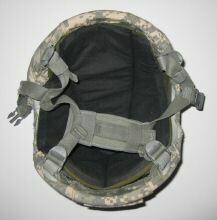 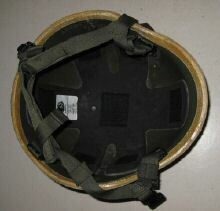 It is made of Kevlar and has a very complicated suspension, sweat band and chinstrap configuration. 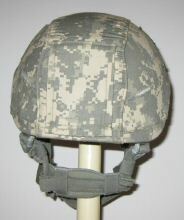 To compare weight, this large size helmet less cover and NVG mount weights 51.7 Oz. 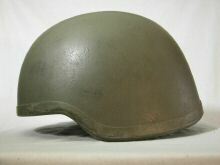 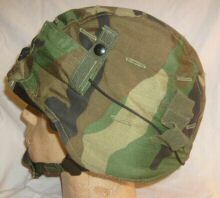 (a standard, large size, PASGT helmet weights 58.0 Oz.)" 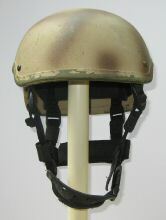 "The shell and chinstrap of this helmet is very much like the first model, the suspension and sweat band have been replaced with a pad system like the ACH helmet. 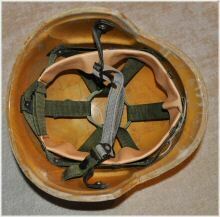 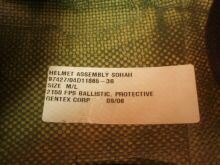 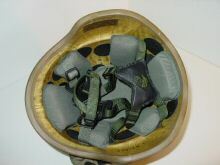 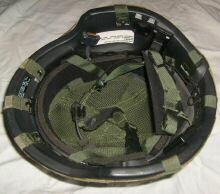 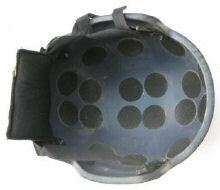 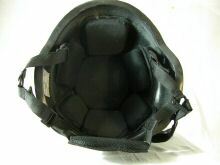 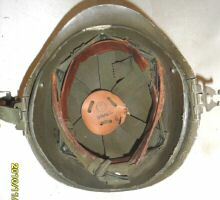 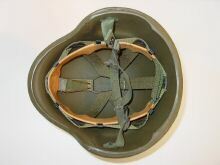 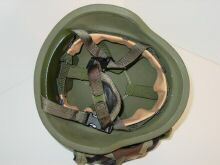 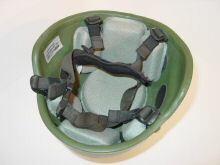 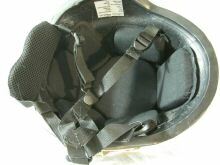 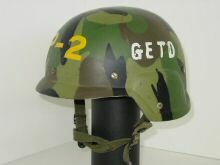 The Gentex web site states the helmet “base material is a state-of-the-art para-aramid using a unique construction resulting in increased ballistic protection”. 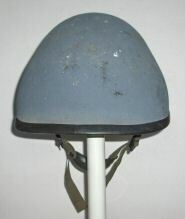 To compare weight, this large size helmet weights 54.3 Oz. 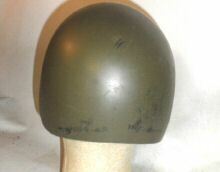 (a standard, large size, PASGT helmet weights 58.0 Oz.)" 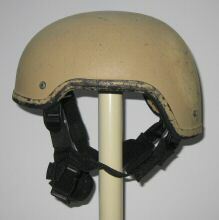 "This helmet was made by Unicor, it is almost identical to the Gentex version with the exception of the suspension and helmet shell color. 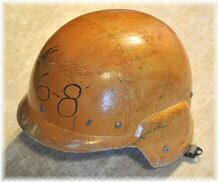 To compare weight, this large size helmet weighs 56.7 Oz. 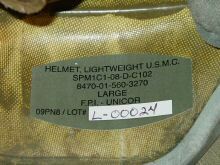 (a standard, large size, PASGT helmet weights 58.0 Oz.)" 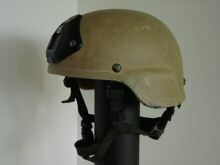 "A recent return from Afghanistan, this “salty” ACH really shows character and considerable use. 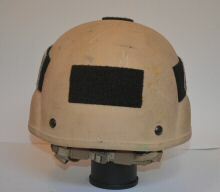 The helmet is made by is made by Specialty Defense Systems and is complete and unaltered as purchased with an NVG mount, neck (nape) armor and cover. 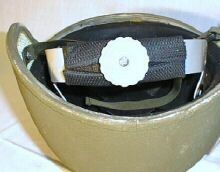 Note the interesting method of tying the cover to the helmet." 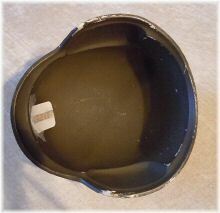 "Mk.4 has a dreadful arrangement of styrofoam blocks glued inside - most of which have fallen away, leaving an awful goo of dissolved rubber cement which I had to clean out." 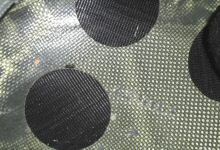 "As with the example above all the liner pads have fallen away - possible problem with the adhesive used?" 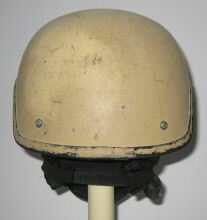 EX51-1 - the original composite helmet ? 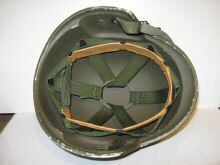 "I think this one fits in as the outer body is aluminium not steel, and the 9-ply basket weave nylon liner has ballistic properties in its own right (indeed it provided most of the protection). 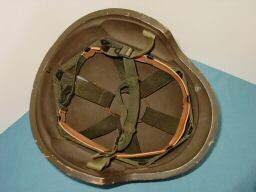 The project which began in 1949 was an attempt to develop a one-size-fits-all two-piece helmet, designed for common use by infantry, paratroops and AFV crews. 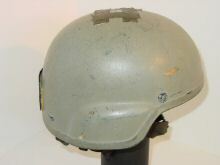 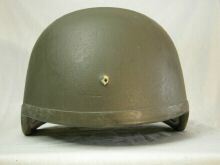 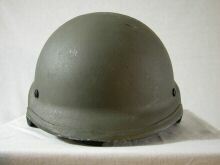 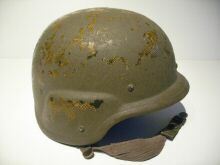 Between 1949 and 1953 US Ordnance trialled sucessive variations of the EX-49, EX-51, and EX-53 series of helmets, but found the aluminium shell too fragile for service use, and the overall design unsuitable for tank and airborne use. 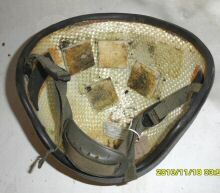 In the end the effort was largely abandoned. 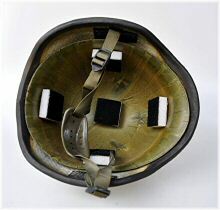 However, the experimental nylon or doron laminated fabric liners tried with the EX-49 to EX-53 series were ballistically promising, and US efforts therefore shifted to developing the nylon version of the M-1 liner." 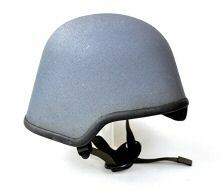 GENTEX MC140D AFV hooded helmet. 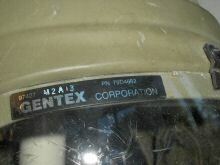 "The MC140 was a family of helmets made by Gentex for the USMC in 1981:- MC140A (Amphibious Crew), MC140 (Helicopter Support), MC140C (Artilleryman - no Comms), MC140B (Artilleryman - Comms), MC140D (Motorcyclist - Comms) and MC140E (Vehicle Comms). 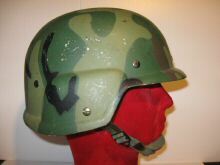 The MC140D (this example) was made for fast attack vehicle crew including dune buggy crew and motorcyclists. 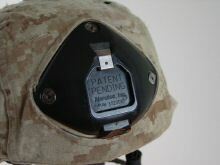 A revised version of the MC140D resulted following a request from the USMC to make it lighter, cheaper and stronger. 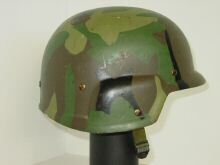 The new version had 15 layers of Kevlar and was stronger (V50 1,600 FPS) than the old steel M1 helmet but not as strong as the new PASGT which was coming into service. 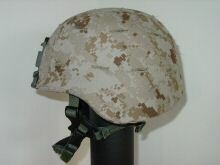 The USMC bought 5,000 helmets in the MC140 range but it is not clear if the MC140D was included. 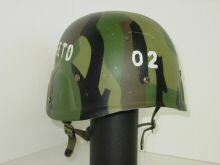 Further designs were submitted, including another from Gentex, when the US Army were looking for a new helmet for fast vehicle crews but its unclear if these were adopted. 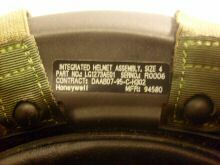 Gentex next success in this area appears to be with the MMH II helmet in 1992 (US Army and USAF acquired 700) - this was a motorcycle helmet with comms, very similar in functionality and protection levels (but not in appearance) to the MC140D." 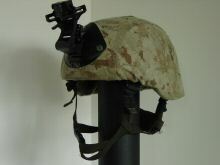 "This helmet is used by MARSOC (Marine Corps Special Operations Command) or FAST Co. (USMC Fleet Antiterrorism Security Team) groups. 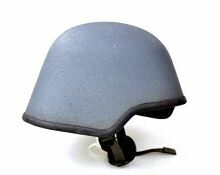 The helmet is missing it’s Mfg. 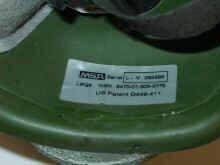 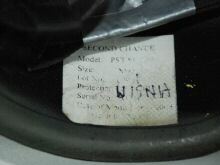 ID label, but there is a model and date marker applied to the interior (typical of MSA helmets)." 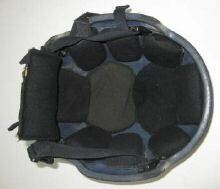 SECOND CHANCE BODY ARMOR - commercial or police use? 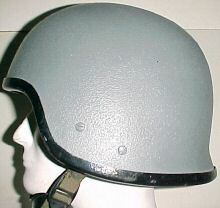 "This is a "cut-down" version of the MICH helmet also called "Gunslinger", "Gunfighter", "Headset-Cut" or "Half-cut". 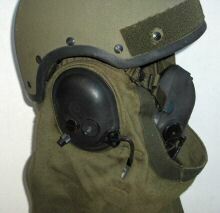 It has shallow sides to provide improved interface with various headsets. 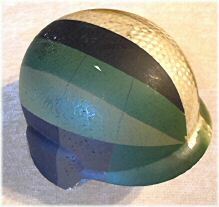 This one is painted sand-yellow on the outside and dark blue inside. 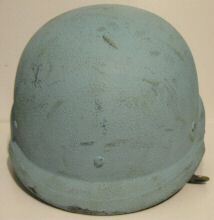 It may have been dark blue overall at one time as these helmets are intended for Law Enforcement personnel as well as Coalition Military Special Forces so this example may have been a private-purchase item rather than “issue”. 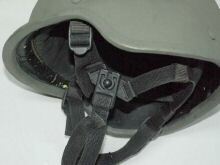 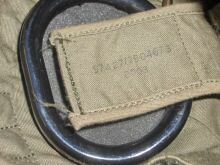 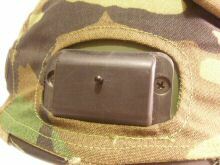 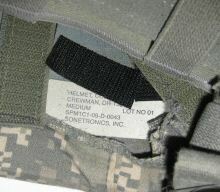 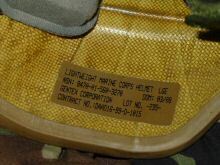 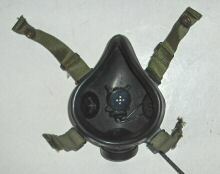 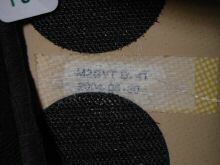 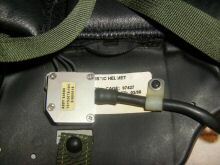 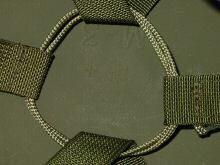 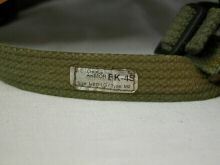 There are no markings / labels in this example except for "LK20E 1T" which is stamped onto the strap attachments to the lugs. 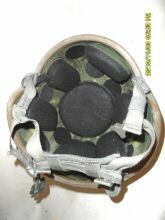 The liner is the velcro-pad variety (this one has 10 pads by 2 different manufacturers). 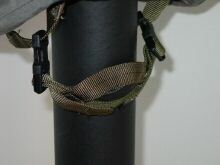 There's a 4-point harness/strap in black cotton webbing with 2-strap chin cup. 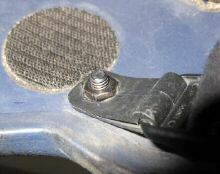 The 4 nuts/bolts appear quite "industrial" and may be replacements. 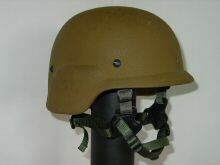 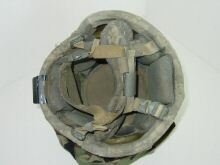 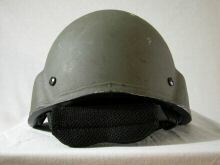 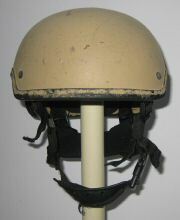 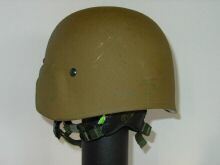 Many photos exist of this style of helmet being worn by US SF troops but this example was used within the private security sector, in Basra, Iraq. 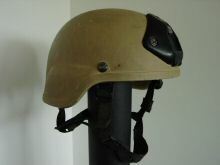 The owner of the helmet worked in private security having previously been a member of British SF (2 tours of Afghanistan ). 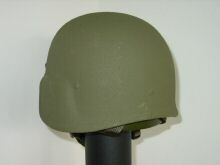 My thanks to Mark S for his research"
"It is very similar to CVC helmets in shape, but thicker and providing better ballistic protection. 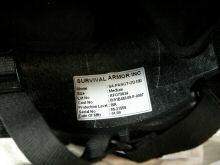 It is used by US Navy boat crews, SEALs and some other units. 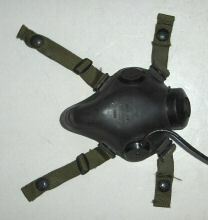 The chinstrap system is four-points, similar to that seen on LWH. 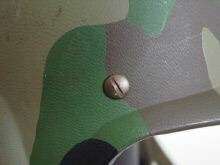 It is attached with 4 rivets. 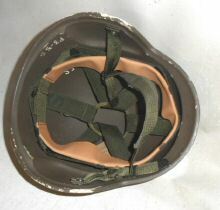 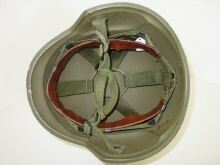 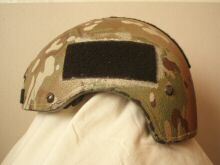 The liner is standard as used on current issue US helmets. 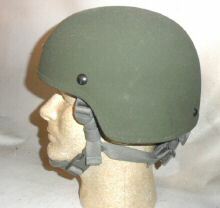 This is another Hi-Cut composite helmet. 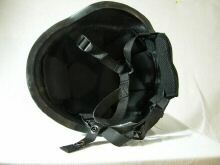 This one has a black netted-crown liner which is adjustable at the sides via Velcro straps. 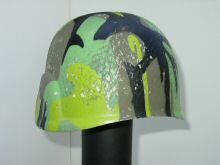 This one has a hard green edge piece and has been custom-camouflaged. 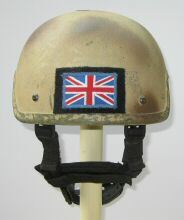 It has a"glint square" applied to the top and a Union flag patch to the rear. 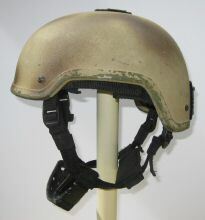 It was used in Afghanistan by British forces. 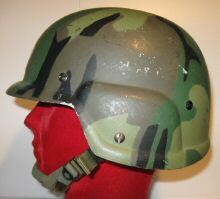 Similar to the example shown above, but with a different liner. 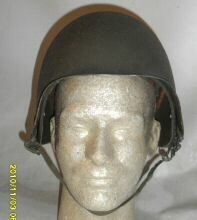 In the Kejo catalogue (here) as a 'Special Forces' helmet. 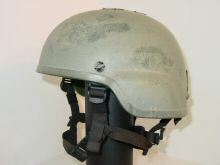 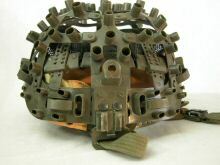 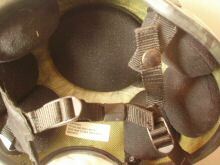 "It is not clear whether this CVC helmet was used as designated or adapted for SF use. 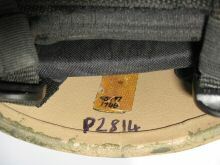 The original label remains. 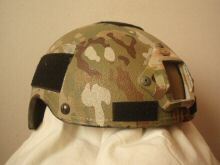 This one is fitted with an "Aero" liner which is effectively a padded skull cap which attaches, via Velcro, to the inner shell." 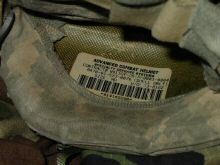 "Land Warrior is a United States Army program, cancelled in 2007, that was to use a combination of commercial, off-the-shelf technology (COTS) and current-issue military gear and equipment designed to: integrate small arms with high-tech equipment; provide communications and command and control at the infantry soldier level; look at the individual infantry soldier as a complete unit rather than as a segment of a larger force. 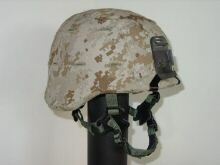 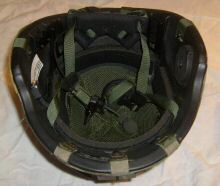 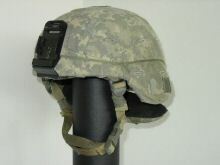 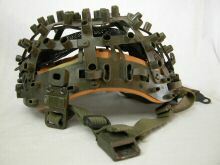 The Helmet Subsystem (HSS) combined a lightweight advanced helmet with a computer and OLED display that provided various information from digital maps and troop locations down to his weapon-mounted video camera. 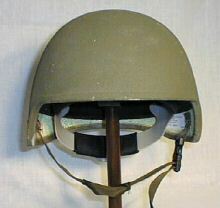 This is what would have allowed the soldier to see (and fire) around corners. 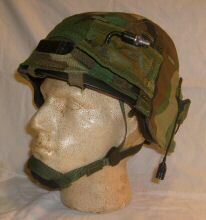 The HSS also incorporated a microphone as well as a headset." 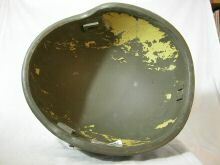 Early prototype shell with a variant of paint-on camo colours. 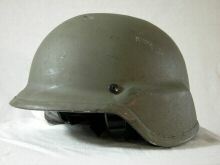 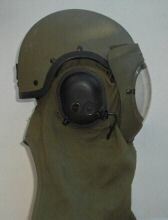 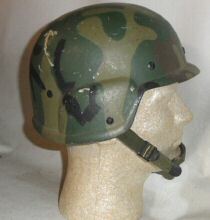 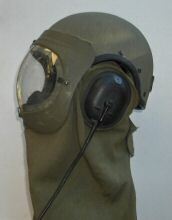 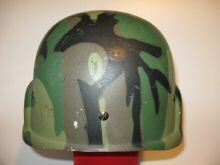 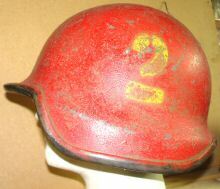 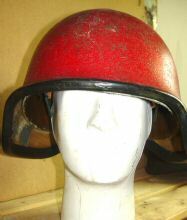 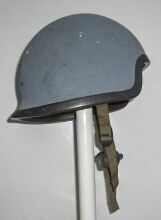 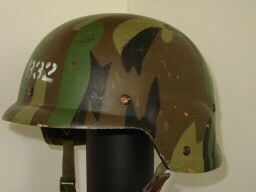 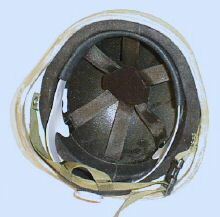 An unusual helmet with a Nosha-type liner and chinstrap, altogether having a very superficial resemblance to the German Schuberth 826 and 828 but there is unlikely to be a direct connection between Schuberth and this US company, which is now extinct, having later traded under the name of DIAMONDBACK TACTICAL. 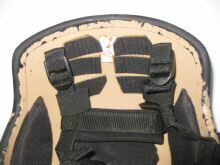 Other unusual characteristics include the liner slotting into recievers glued (?) 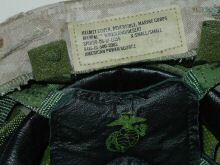 into the interior of the shell, and the frankly odd little label sewn to one arm of the chinstrap. 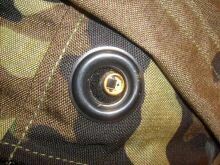 There is a crude hole at the front which may have held a device of some kind. 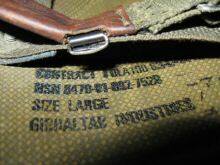 This is on obscure and strange thing and more investigation is required. 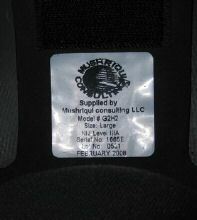 MUSHRIQUI are/were a US-based company providing security products, and business solutions to military, homeland security, and other similar services. 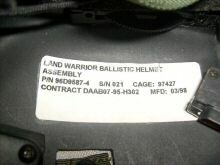 It is not clear if they actually manufacture this model or simply supply/label it. 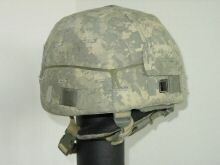 It is quite similar to the Second Chance PASGT / MICH Hybrid. 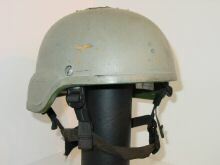 Their markets are stated to be Egypt; Jordan; Kuwait; Lebanon;Oman; Saudi Arabia; United Arab Emirates; Turkey and photographs claim to show ISOF (Iraqi Special Operations Force) troops wearing MC helmets. 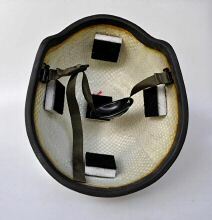 This model has an inner star-shaped thin rubber-like liner shell to which are attached Velcro receiving pads - these attach directly to the 7 liner pads. 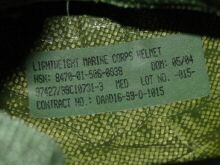 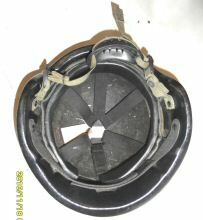 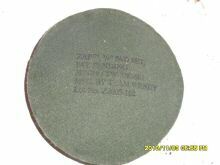 No other shell markings can be seen although they may be obscured by the rubber liner insert. 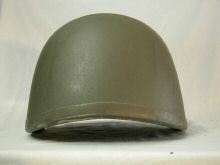 This model has no rim piece enabling us to see the underlying unpainted material. 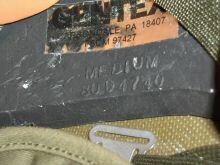 Internal markings in pen (4/4 and SQ14 CLIENT) suggest this may be a demonstration or evaluation model. 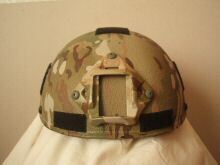 Mushriqui Consulting LLC provides consulting services. 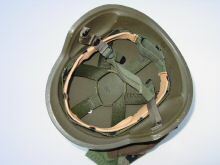 The Company offers security and military products, construction, electricity, power, procurement, medical, pharmaceuticals, wastewater treatment, and interior design. 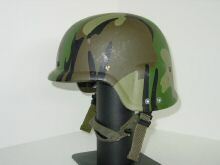 Mushriqui Consulting offers products and services to national and international customers. 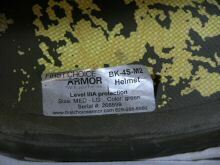 (Above taken from Bloomberg website. 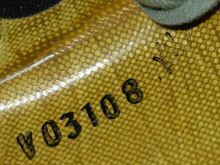 The postal address given is in Virginia, USA. 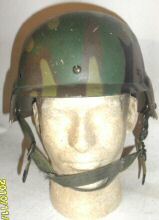 There is also a link to a Mushriqui webpage which no longer exists. 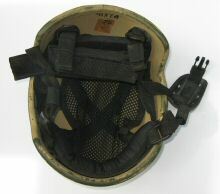 MARSOC ACH produced by MSA. 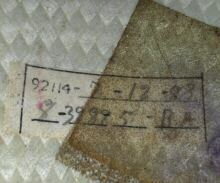 Label missing, no details no date.